Today, the Quincentenary Commemorative Silver Dollar Coin remembers President Nixon’s announcement of the space shuttle program 45 years ago. This coin showcases the exploration of new worlds with the juxtaposition of half of Columbus’s ship and half of the space shuttle. In 1969, a Space Study Task Force began their research into a reusable Space Transportation System. In San Clemente, California, the president announced his objective to pursue the new transport. The Statement by President Nixon, 5 January 1972. I have decided today that the United States should proceed at once with the development of an entirely new type of space transportation system designed to help transform the space frontier of the 1970’s into familiar territory, easily accessible for human endeavor in the 1980’s and ’90’s. This system will center on a space vehicle that can shuttle repeatedly from Earth to orbit and back. It will revolutionize transportation into near space, by routinizing it. It will take the astronomical costs out of astronautics. In short, it will go a long way toward delivering the rich benefits of practical space utilization and the valuable spinoffs from space efforts into the daily lives of Americans and all people. The new year 1972 is a year of conclusion for America’s current series of manned flights to the Moon. Much is expected from the two remaining Apollo missions – in fact, their scientific results should exceed the return from all the earlier flights together. Thus they will place a fitting capstone on this vastly successful undertaking. But they also bring us to an important decision point – a point of assessing what our space horizons are as Apollo ends, and of determining where we go from here. In the scientific arena, the past decade of experience has taught us that spacecraft are an irreplaceable tool for learning about our near-Earth space environment, the Moon, and the planets, besides being an important aid to our studies of the Sun and stars. In utilizing space to meet needs on Earth, we have seen the tremendous potential of satellites for international communications and world-wide weather forecasting. We are gaining the capability to use satellites as tools in global monitoring and management of nature resources, in agricultural applications, and in pollution control. We can foresee their use in guiding airliners across the oceans and in bringing TV education to wide areas of the world. However, all these possibilities, and countless others with direct and dramatic bearing on human betterment, can never be more than fractionally realized so long as every single trip from Earth to orbit remains a matter of special effort and staggering expense. This is why commitment to the Space Shuttle program is the right step for America to take, in moving out from our present beach-head in the sky to achieve a real working presence in space – because the Space Shuttle will give us routine access to space by sharply reducing costs in dollars and preparation time. The new system will differ radically from all existing booster systems, in that most of this new system will be recovered and used again and again – up to 100 times. The resulting economies may bring operating costs down as low as one-tenth of those present launch vehicles. The resulting changes in modes of flight and re-entry will make the ride safer, and less demanding for the passengers, so that men and women with work to do in space can “commute” aloft, without having to spend years in training for the skills and rigors of old-style space flight. As scientists and technicians are actually able to accompany their instruments into space, limiting boundaries between our manned and unmanned space programmes will disappear. Development of new space applications will be able to proceed much faster. Repair or servicing of satellites in space will become possible, as will delivery of valuable payloads from orbit back to Earth. The general reliability and versatility which the Shuttle system offers seems likely to establish it quickly as the workhorse of our whole space effort, taking the place of all present launch vehicles except the very smallest and very largest. NASA and many aerospace companies have carried out extensive design studies for the Shuttle. Congress has reviewed and approved this effort. Preparation is now sufficient for us to commence the actual work of construction with full confidence of success. In order to minimize technical and economic risks, the space agency will continue to take a cautious evolutionary approach in the development of this new system. Even so, by moving ahead at this time, we can have the Shuttle in manned flight by 1978, and operational a short time later. It is also significant that this major new national enterprise will engage the best efforts of thousands of highly skilled workers and hundreds of contractor firms over the next several years. The amazing ‘technology explosion’ that has swept this country in the years since we ventured into space should remind us that robust activity in the aerospace industry is healthy for everyone – not just in jobs and income, but in the extension of our capabilities in every direction. The continued pre-eminence of America and American industry in the aerospace field will be an important part of the Shuttle’s ‘payload’. Views of the Earth from space have shown us how small and fragile our home planet truly is. We are learning the imperatives of universal brotherhood and global ecology learning to think and act as guardians of one tiny blue and green island in the trackless oceans of the Universe. This new program will give more people more access to the liberating perspectives of space, even as it extends our ability to cope with physical challenges of Earth and broadens our opportunities for international cooperation in low-cost, multi-purpose space missions. ‘We must sail sometimes with the wind and sometimes against it’, said Oliver Wendell Holmes, ‘but we must sail, and not drift, nor lie at anchor’. So with man’s epic voyage into space – a voyage the United States of America has led and still shall lead. 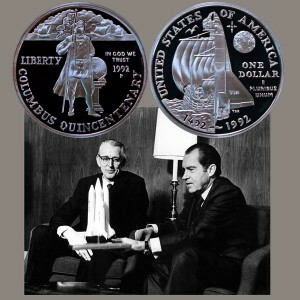 The Columbus Quincentenary Commemorative Silver Dollar Coin shows with an image of President Nixon and Dr. James C. Fletcher, NASA Administrator, discussing the Space Shuttle program at San Clemente, California on January 5, 1972.